This book describes the role of social and socio-psychological factors in the process of dialect levelling. The political history of the Frisian Islands which have changed hands between Holland and Friesland in the course of history is still visible in its language varieties, as the dialects of Ameland and Terschelling are so-called mixed dialects: they contain both Dutch and Frisian elements, where the Dutch comes from the dialect that used to be spoken in the province of Holland. 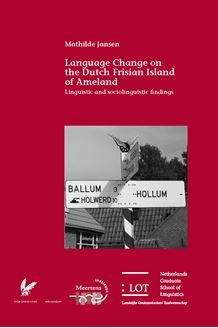 In this thesis, we study the present-day development of the mixed dialect spoken on Ameland. The influence of the surrounding standard languages on the dialects is measured on different linguistic levels, i.e. phonology and morphology. By comparing the dialect competence and obtaining data from three generations of dialect speakers the degrees of language maintenance and language loss will be assessed. The influence of both the Dutch and Frisian standard language is taken into account. One of the central questions is whether horizontal (cross-dialectal) convergence or vertical convergence (towards the Frisian or Dutch standard) is dominant in the levelling process. Do the islanders react against the huge numbers of tourists visiting the island each year? Attitude data will be adduced to focus on the individual language user. The attitudes towards the dialect and the surrounding standard languages may influence the process of dialect change.